HNTB's Lynette Mellett, PE, and Shawn J. Murphy, PE, were named as “Top 40 Under 40” award recipients by Airport Business magazine. Not only are Lynette and Shawn leaders dedicated to excellence and the advancement of the industry, but they also devote personal time to organizations in order to support aviation engineering in their communities. 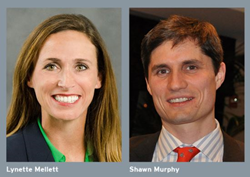 Two of HNTB Corporation’s aviation experts — Lynette Mellett, PE, and Shawn J. Murphy, PE — were named as “Top 40 Under 40” award recipients by Airport Business magazine. The annual award recognizes 40 aviation industry professionals under the age of 40 for their academic, professional and community achievements. Mellett joined HNTB as a project engineer in 2003 after graduation from Iowa State University and worked on a variety of civil projects while preparing for the professional engineer exam. She began her aviation path working with three general aviation airports on “on call” contracts in the Federal Aviation Administration central region. As her career progressed, she added international and more general aviation airport projects. She was awarded her Professional Engineer license in 2008 from the State of Kansas and was promoted to project manager at HNTB. In 2013, she began her current role as aviation section manger. She is responsible for delivery of all civil aviation projects from HNTB’s Kansas City office, ensuring quality, maintaining budgets, schedules and exceeding clients’ expectations. Murphy joined HNTB in 2005 after earning a civil engineering degree from the University of Illinois at Chicago. As a member of the aviation design team, his first project was the Runway 10L-28R Extension, part of the O’Hare International Airport Modernization Program. This was the first major runway project completed under the program and its design garnered an Honor Award from the American Council of Engineering Companies of Illinois. Additional experience included a wide range of airfield capital improvement projects at O’Hare, Midway International Airport, and Louisville International Airport, and an assault landing zone runway at Lakehurst Naval Air Engineering Station used for C-17 and C-130 cooperative training flights, for which he completed a Pavement Design & Management course with the United States Air Force Academy. In his current role as HNTB project manager, Murphy is responsible for delivery of construction phase services on all contracts of the Runway 9C-27C program, the final major runway project of the O’Hare Modernization Program. Airport Business magazine is the most widely circulated and audited business publication that targets professionals who manage airports, airport-based businesses and corporate flight facilities in North America. Its more than 17,000 subscribers are critical to the safe operation of the North American air transportation system. This is the sixth year of the Top 40 program. Many past honorees are now leading major institutions and projects of the aviation industry due to their dedication and recognition for their valuable skills. According to Engineering News-Record’s Top Design Firms Sourcebook for 2017, HNTB moved up in the rankings to the top six airport consulting firms in the United States. HNTB’s many signature aviation projects include design of the air traffic control tower at San Francisco International Airport; design of the T2 West “Green Build” terminal expansion at San Diego International Airport; program management at Dallas-Fort Worth International Airport; architectural and engineering and design services at Los Angeles International Airport; design and construction management of runway status lights implementation at airports across the country; program management and owner’s representative services for Chicago’s O’Hare and Midway international airports; program management and construction management for the Hotel and Transit Center at Denver International Airport; taxiway design, construction services improvements and a terminal planning study at Kansas City International Airport; and master plan update for Tampa International Airport. The firm’s largest ongoing aviation project is serving as architect of record for design of the new South Terminal C at Orlando International Airport. HNTB Corporation is an employee-owned infrastructure firm serving public and private owners and contractors. Celebrating a century of service, HNTB understands the life cycle of infrastructure and addresses clients’ most complex technical, financial and operational challenges. Professionals nationwide deliver a full range of infrastructure-related services, including award-winning planning, design, program management and construction management. For more information, visit http://www.hntb.com.